Festival Resort are vacation town homes designed and priced to make your dreams of the ideal Orlando vacation home come true. This is a once-in-a-lifetime opportunity to own a piece of the magic that you will celebrate for generations to come. It welcomes you and your guests with a dazzling combination of Florida resort living and attraction-quality amenities at Downtown Festival! These elegant resort vacation villa residences overlook nature preserves and are specifically designed to accommodate larger groups of vacationing families and friends. A variety of spacious floor plans feature three to five bedrooms and up to 5 ½ baths. Expansive island kitchen, dining and living areas provide family-sized dining and gathering space. 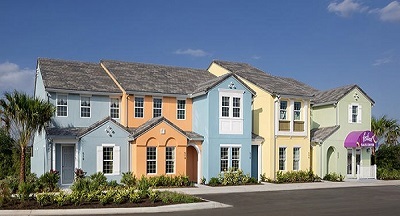 A New Style to the Vacation Town Home Community in the Disney Orlando area.